Sol 1673: Planning with plenty of "Moxie"
The two materials, separated by what looked like bright-toned, sulfate vein material, caught the GEO team's eye, leading us to plan multiple observations of these materials. The "Sorrento Harbor" target aimed to capture the transition from the Murray bedrock to the vein material, and the "Bean Point" target investigated a gray patch among the vein material. This gray patch resembled similar gray patches targeted over the last several weeks given their unique textures and chemistries. The AEGIS-targeted ChemCam raster, acquired post-drive on Sol 1673, ended up hitting the darker, smoother capping material, but GEO complemented it with a second target, "Cape Levi", on another patch of this material in front of the rover. The "Chimney Peak" target, a raster across multiple layers of Murray bedrock, rounded out our targeted ChemCam activities. GEO kept Mastcam similarly busy. We imaged all the ChemCam targets, acquired a mosaic covering the contact between the darker, smoother capping material, the sulfate vein material, and the underlying Murray, and a stereo mosaic of the "Moxie Mountain" outcrop to investigate the dip of the Murray formation at this spot. ENV scanned the skies of Gale crater with a variety of images and movies to look for clouds and variations in atmospheric properties. DAN acquired a long passive observation, and regular REMS and RAD measurements will extend our environmental monitoring record within Gale. Given the sand-covered terrain a few meters ahead of the rover, the rover planners kept today's drive fairly conservative - 10-15 m - to give us a better look at possible drive paths for the weekend. 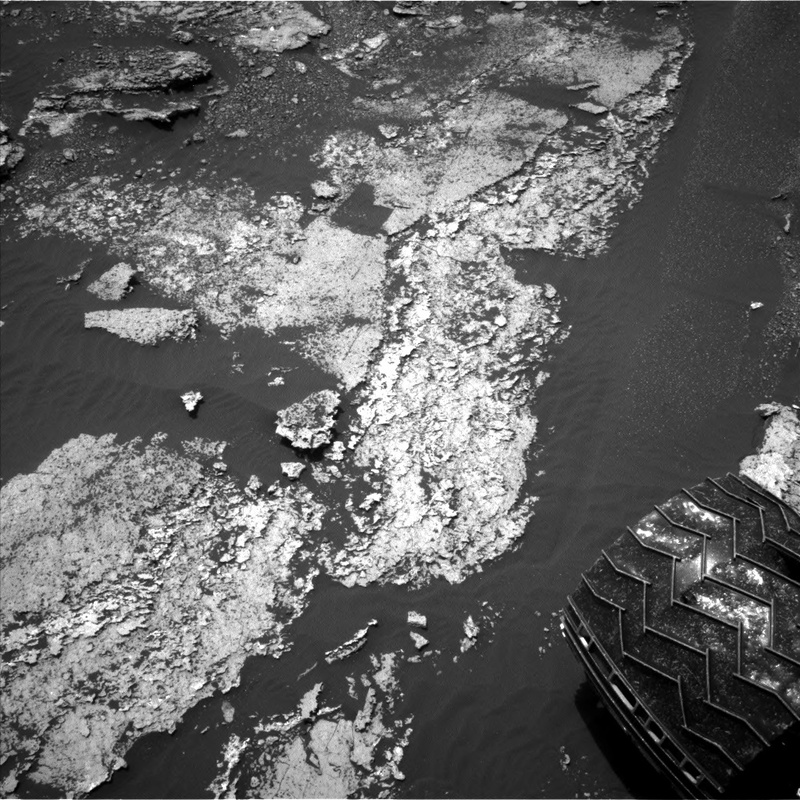 They'll drive us up to a nice curb of bedrock for weekend targeted and contact science! The arm unstow after our drive will give our post-drive images with Navcam and Mastcam an unobstructed view of our weekend work (play?) space.